Remain physically active every day including walking, biking, swimming, exercising, stretching, dancing and any other activity that keeps people moving! Learn about and understand good nutrition and make healthy food choices each day when buying foods, cooking, eating, and ordering at local restaurants/food establishments. 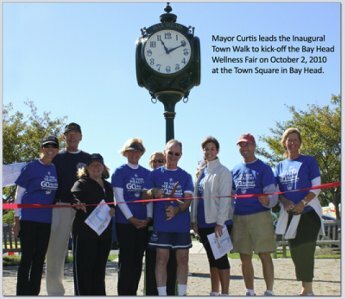 The campaign was launched on March 1, 2010 when the Town Council of the Borough of Bay Head unanimously passed a resolution creating the Mayors Wellness Campaign. The campaign was named "GO Bay Head!" as a call to action to encourage residents, schools, local business, and government officials to help meet these objectives. On April 1, 2011, Bay Head was named the 11th town in New Jersey and the first shore community to be designated as a "Healthy Town" in recognition of the town's health and wellness initiatives. So please join our campaign by staying active and eating smart. Small changes can make a big difference and you'll feel great! And feel free to browse this site to learn more about our activities.